Bandai Namco’s newest trailers for its manga-uniting Jump Force game previewed the pre-order bonuses players can expect from franchises like Dragon Ball Z, Naruto, and One Piece. 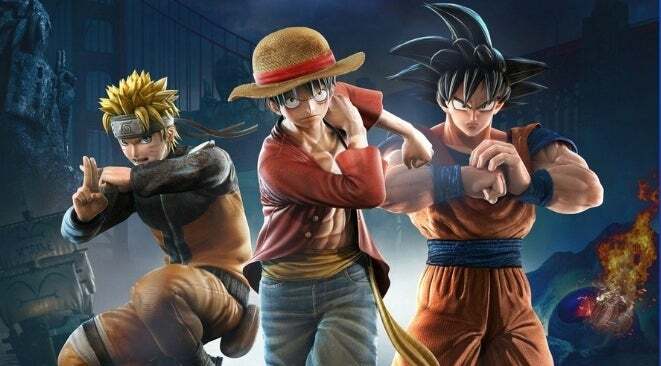 Jump Force features characters from all kinds of different anime and manga, but the three brands above have served as the poster franchises for the game, so it makes sense that the pre-order bonuses would take inspiration from them. Players can essentially turn their characters into Goku (and other Saiyans) from Dragon Ball Z, Luffy from One Piece, and Naruto from the show of the same name with the game’s character creation system, but they can get even closer to the true look of these fan-favorite characters by pre-ordering the game. The video above previews the different pre-order items, and more trailers below shine the spotlight on each individual bonus. The first of the pre-order bonuses is a special vehicle for the game’s lobby that’s pulled straight from Dragon Ball Z.
Frieza is one of the many characters included in Jump Force, but he got his start in Dragon Ball Z where he commanded Saiyans to do his bidding end eventually went to war with Goku and the rest of Earth’s fighters. But when he doesn’t need to exert much effort, he’s floating around in the hover pod seen in the video above. People who pre-order Jump Force will get that hover pod and can float around just like Frieza in the game’s lobby. Another pre-order bonus comes from Dragon Ball Z as well and lets players look like the early versions of Saiyans when they were dressed in their Battle Armor. Perhaps most recognizably worn by Vegeta and Nappa as well as Gohan, the Battle Armor is seen during the first few sagas of Dragon Ball Z. Frieza’s legion of Saiyans always wear this armor, though the appearance of the outfit changed over time depending on who was wearing it. Moving away from Dragon Ball Z, the next pre-order bonus comes from One Piece. Luffy is the main character who’s been included in the game so far, but he’s not the only one who’s been added so far. The infamous pirate known as Gol D. Roger wears a regal-looking coat in the anime and manga, and players can put on that same outfit if they pre-order the game to better put together their One Piece looks. The final pre-order item for Jump Force comes from Naruto and lets players look even more like the main character of that anime and manga by donning his Hokage Cloak. The trailer above shows what the cloak will look like on someone who made their appearance closely resemble Naruto. Jump Force is scheduled to be released worldwide on February 15th, but there’s an open beta planned for later this month to preview the game before that release.